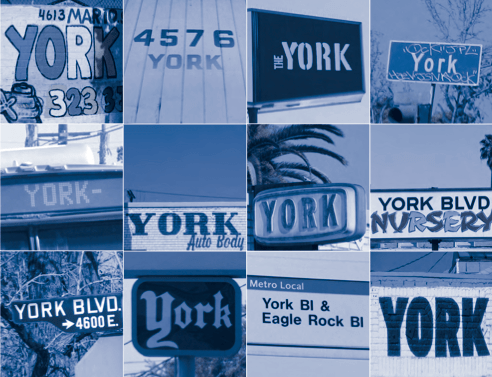 All images via ##http://la.streetsblog.org/wp-content/pdf/york_blvd_final_report_compress.pdf##York Boulevard: The Economics of a Road Diet##. A poster presentation made at Pro Walk Pro Bike is available at ##http://www.scribd.com/doc/106281011/York-Blvd-The-Economics-of-a-Road-Diet##Scribd##. 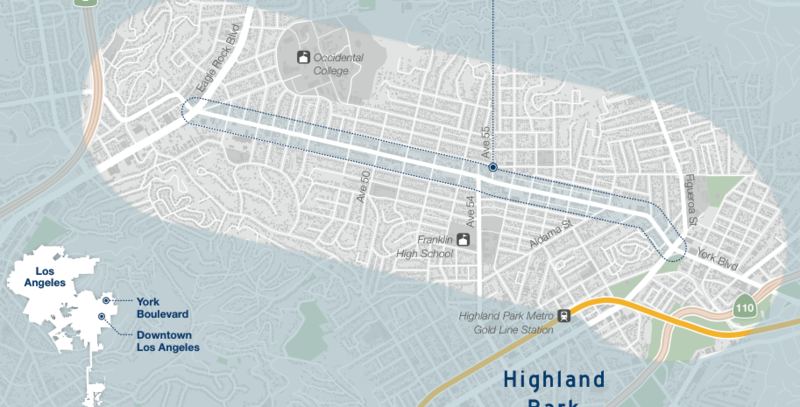 A recent report by Cullen McCormick uses a road diet in Northeast Los Angeles as a case study to examine the economic impacts of reducing mixed-use travel lanes and increasing bicycle lanes. Despite the traditional opposition of local businesses when diets are proposed in front of their stores, McCormick’s case study finds there was little difference in the hyper local economies after a portion of York Boulevard underwent a road diet in 2006. Click on the image to go to the full report. In 2006, the City of Los Angeles put 1.1 miles of York Boulevard on a road diet. They narrowed the street from four mixed-use travel lanes to two mixed-use lanes, a turn lane, and two bicycle lanes between Eagle Rock Boulevard and Avenue 52, dividing in half the corridor McCormick would study in 2011 and 2012. McCormick is aware of two competing ideologies when it comes to the issue of bikes, bike lanes and retail profit. On one hand, retailers around the world fear a change in the status quo and often fight against changes to the existing transportation infrastructure. On the other “bikes are good for business” has been a mantra for bike advocates, especially with the launch of the Bike Friendly Business District model in Long Beach that is catching on around the country. One area gets a diet, one doesn't. Next, he looked at the economic impact of the diet on property value and taxes collected. Again, the study found the diet had no impact on property values, although there was a slight increase in taxes collected in the dieted area versus the area with the original configuration. The higher tax receipts, which points to higher sales, wasn’t higher enough east of Avenue 52 for McCormick to make a firm statement. There was also a significant difference on the east and west sides of Avenue 52 in the number of businesses closed, businesses opened, or property resale value to state whether or not the diet had a definite impact. While bicycling advocates clearly would have preferred the study state that businesses were doing better and property was selling at a higher rate than the non-dieted area, the report is still valuable for those advocating road diets. After all, if there is no economic impact to putting a road diet in place, then detractors are only left with the argument that road diets are inconvenient for drivers. That argument has not proven to be a winner against an argument, backed up with statistics, that road diets make streets safer. The title of this piece states “Economic review of 6th street road diet” and yet all of the information contained within is about York Blvd. It really is gratifying to say something for several years in public meetings and private conversations and to finally see someone do that thing. I can take no credit for this study, but I am grateful for the attention given this area through this study. Bringing facts, not just anecdotes, to the table is exactly what our poicy makers need. Democracy is supposed to rely on facts being presented in front of the decision making bodies. Right now, that doesn’t happen. Studies like this bring us closer to resilient city planning, higher quality of life, and a robust retail climate. Don’t downplay yourself, Josef. It was your idea that bounced around the department until Cullen took hold of it. I was just at the Flying Pigeon and he didn’t believe me until I told him Cullen mentioned Josef particularly in the interview. Too many of our volunteer advocates don’t realize the ripples they’ve made in helping to get things done better. What a refreshing read–I sincerely hope this experiment continues throughout L.A. and throughout the rest of the country! As “road diets” become more common, people will finally begin to seek alternatives to driving everywhere. While businesses may become less accessible to people traveling greater distances, I suspect that businesses may become more accessible and attractive to the local community. Thoughts? Also, how do you feel about designating a lane to public transportation? Y’all need to fix the headline! Is the penultimate paragraph correct? It doesn’t seem to make sense. Should it say “There was NOT a significant difference on the east and west sides of Avenue 52 …”? Cyclists Go Positive Against Mis-Information Campaign in Northeast L.A. Welcome to the Bike Wars. City Announces Meetings for Bike Plan EIR.